Cranberries are native to North America. 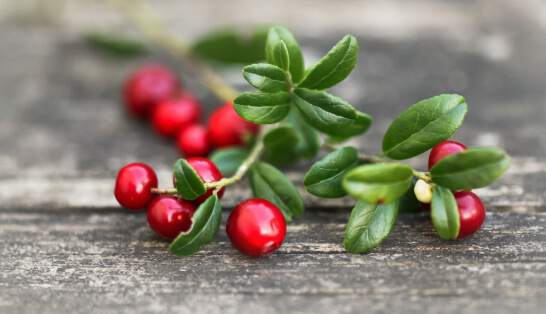 They were reportedly called “crane berries” by pilgrims because of the cranberry flower’s resemblance to the head and bill of a crane. Pilgrims and other early settlers ate cranberries to help fight off scurvy. Native Americans are reported to have used cranberries for a variety of reasons, including for wound medicine and dye. There are more than 100 varieties of cranberries, and the bright, beautiful red color of this fruit is an immediate clue that these precious gems are packed with health benefits. Here are a few reasons why you should not limit eating cranberries to just Thanksgiving. Cranberries are very rich in antioxidants. Some studies have identified more than two dozen antioxidant phytonutrients in cranberries. Other studies say cranberries outrank the antioxidant level of strawberries, spinach, broccoli, red grapes, apples, raspberries and cherries! Antioxidants are critical for your immune system and heart health. They may also reduce your risk for certain cancers. Cranberries may help keep you hydrated. It is extremely important to stay hydrated, but sometimes you may get sick of drinking plain old water. The good news is you can also get some of your necessary daily water intake from eating certain foods, like cranberries which are about 88% water. Cranberries may help prevent urinary tract infections (UTI). Lower UTIs occur in at least 60% of women at some point in their lives. UTIs are more common in women than men, because women have shorter urethras that more easily allow bacteria to ascend into the bladder. In order to treat a UTI, antibiotics are often prescribed. But UTIs are so common and can repeatedly happen in some people that the bacteria causing the infection may become resistant to antibiotics. Cranberries are high in powerful antioxidants called proanthocyanidins (PACs), which may prevent bacteria from adhering to urinary tract walls and causing infection. Some reports say it takes a high concentration of cranberry to prevent bacterial adhesion. Ask your doctor about taking a cranberry capsule if you suffer from UTIs. And keep in mind that if you think you have a UTI, you still may need to see a doctor for a proper diagnosis. Do not self-diagnose and use cranberry products as a treatment replacement for medications you may need to take. Cranberries may be great for your teeth. The phytochemicals in cranberries may help prevent tooth decay and gingivitis. This is because they may help prevent overgrowth of bacteria in the mouth and prevent bacteria from adhering to the teeth and gums. Check out this cranberry dental floss! Cranberries may help prevent cancer. Cancer research involving cranberries has revealed some evidence that cranberries may help fight several types of cancer. “Specifically, cranberry derived ursolic acid, proanthocyanidins and an organic-soluble cranberry extract inhibit the growth of breast, colon, cervical, glioblastoma, leukemia, lung, melanoma, oral cavity, prostate and renal cancer cell lines,” according to the National Institutes for Health (NIH). Research showed cranberry may cause apoptosis (cell death) in cancer cells and slow the growth of tumors. This may very well be due to the antioxidant and anti-inflammatory properties of cranberries. Cranberries may help prevent heart disease. Cranberries are rich in polyphenols, micronutrients found in many plant-based foods that have powerful antioxidant properties. The National Institutes for Health (NIH) reports that a growing body of evidence shows that polyphenols may reduce the risk of cardiovascular disease by increasing the resistance of LDL to oxidation (which may cause free radical tissue damage), inhibiting platelet aggregation (clumping together of platelets in blood) and reducing blood pressure and anti-inflammatory mechanisms. Cranberries may reduce the risk of developing Type 2 diabetes. The United States Department of Agriculture (USDA) reported that drinking two 8-ounce glasses of cranberry juice daily could reduce the risk of developing Type 2 diabetes. This may be due to the polyphenols present in cranberries. If you are prediabetic or diabetic, talk to your doctor first before you aim to drink this much cranberry juice daily. Cranberry juice does contain sugar, so you have to assess with a doctor or competent medical professional how much sugar you can have on a daily basis. Also stay away from cranberry juice concentrate, which may be processed and have a lot of added sugar. Calcium, 9 mg. Of course, calcium is important for building and maintaining strong bones and teeth. This mineral is also important for maintaining hair and nail health in perimenopausal and menopausal women. Adequate calcium intake may also decrease your risk for colorectal cancer. Magnesium, 7 mg. Every organ in the body, especially the heart, muscles and kidneys, needs magnesium. It is required for more than 300 biochemical reactions in the body and is the fourth most abundant mineral in the body. How much magnesium do you need? Click here to find out. Phosphorus, 12 mg. This mineral may be a key factor in preventing obesity. A study in Lebanon showed that phosphorus supplements in a small group (63 people) for just 12 weeks significantly decreased body weight, BMI, waist circumference and subjective appetite scores. Potassium, 88 mg. This must-have mineral works with sodium to balance the fluids and electrolytes in your body. Potassium helps keep blood pressure under control and may even help reduce kidney stones and bone loss as you age. Vitamin C, 15.4 mg. You likely already know that this vitamin is extremely important for immune function, but vitamin C does so much more than fighting off the common cold. Click here to learn more about the power of vitamin C.
Choline, 6 mg. Choline is a macronutrient important for a number of bodily functions including liver function, normal brain development, nerve function, muscle movement, supporting energy levels and maintaining a healthy metabolism. Vitamin A, 69 IU. Vitamin A helps protect the surface of the eye (cornea) and is also essential for good vision. Vitamin A is also known as retinol. You may have seen retinol in face cleansers and moisturizers because it improves the skin’s elasticity and helps reduce the appearance of wrinkles. Vitamin K, 5.5 mcg. You can find vitamin K in the liver, but you can also find the vitamin in body tissues like the brain, pancreas and heart. Not only does vitamin K help in bone formation and insulin sensitivity, it also prevents calcification, which is when calcium salts build up in your body tissue, vessels and organs, and cause the disruption of your body’s normal process. Finally, it is important to note that consuming large amounts of cranberries and cranberry juice may cause your stomach to be upset and may over time increase the risk of kidney stones, according to the National Institutes of Health (NIH). Remember, too much of a good thing is sometimes bad. For example, large doses of cranberry may alter levels of warfarin, an anticoagulant (blood-thinner). Aside from cranberry sauce, another festive way to incorporate cranberries into your Thanksgiving meal is to freeze them and add to champagne, cocktails or sparkling water. And remember, cranberry sauce often has a lot of added sugar. Don’t limit eating cranberries to just your Thanksgiving dinner. Keep frozen cranberries in your freezer to add to smoothies. For healthy recipes with cranberries, click here.